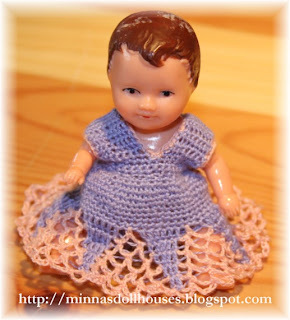 I crocheted this dress for the old Ari baby doll which a friend gave to me. I have a few Ari dolls and I think that I have not introduced all of them in my blog yet. Virkkasin tämän asun vanhalle Ari nukkevauvalle jonka sain ystävältäni. Minulla on useita Ari-nukkeja ja luulen että en ole vielä esitellyt niitä kaikkia blogissani. Great job Minna. The doll is gorgeous and so is the outfit. You did a beautiful job on the crochet! It's so pretty and delicate. So pretty Minna, lovely work. Wow, those are great. Thanks for sharing. Le sienta estupendo el trajecito, esta muy guapo.